I love tropical food and anything that reminds me of a vacation! 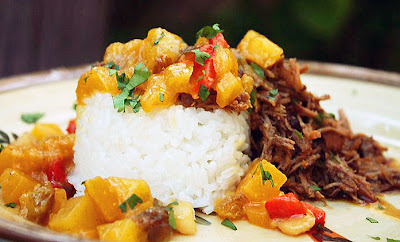 Every time I prepare this recipe, I close my eyes and picture myself in a little restaurant in the Caribbean when I take my first bite. The pulled Jerk Chicken has just a little bit of a spicy kick, while the mango chutney and coconut brown rice cool it off and give it a sweet, fruity flavor! It's colorful, healthy, easy and delicious...just like vacation food should be! In a medium saucepan, heat 1 Tbsp olive oil on high heat. Add 1 cup Basmati rice and toast the rice for 2-3 minutes, stirring constantly. Stir in 1 cup light coconut milk, and 1/2 cup water. Season with salt, bring to a boil, reduce heat to simmer, cover and continue to cook until rice is soft and liquid is absorbed, about 20-25 minutes. Remove from heat and set aside. In a separate, medium saucepan, add mangoes, red bell pepper, chopped scallions, grated ginger, orange juice, apple cider vinegar, 1/4 tsp. red chile flake and 1/2 tsp. Pumpkin pie spice. Season with salt and pepper and stir until all ingredients are combined. Cook on medium heat until fruits and vegetables are soft, and juices are reduced, about 25 minutes. Stir in golden raisins and Macadamia nuts in last 2-3 minutes of cooking. Cut the pork tenderloin into cube size pieces. In a large skillet, heat 1 Tbsp olive oil on medium heat. Add pork and season with salt and pepper. Brown the meat for about 3 minutes on each side. Transfer the meat to a crock pot and add 1 cup low-sodium chicken broth, 1 Tbsp. ground allspice, 1/2 tsp. Ground cloves, 1 tsp. pumpkin pie spice and 1/4 tsp. red chile flake. Stir until ingredients are combined. Cook the meat on high in the crock pot for about 3 hours, until meat is ready to be shredded with a fork. Remove the meat from the crock pot, shred with a fork and transfer it back to the crock pot. Adjust seasoning and add another 1/2 cup chicken broth if necessary. Continue to cook in crock pot for an additional 30-40 minutes. To serve: shape 1/2 cup coconut rice in a 1/2 cup measuring cup. Place on plate. Spoon the shredded pork tenderloin onto the plate over rice. Spoon the mango chutney on top of the pork. Garnish with chopped cilantro. Discover those alluring taste buds with Bhandari Basmati Rice in Pakistan. A premium quality and best basmati rice in Pakistan so rich in flavor, aroma and appearance that it indulges you in to a state of pure nostalgia of basmati heritage. The finest and most exquisite rice with its long and slender grain adds delight to your meal.We leave no stone upturned in providing you the best basmati rice in pakistan and healthy food products.